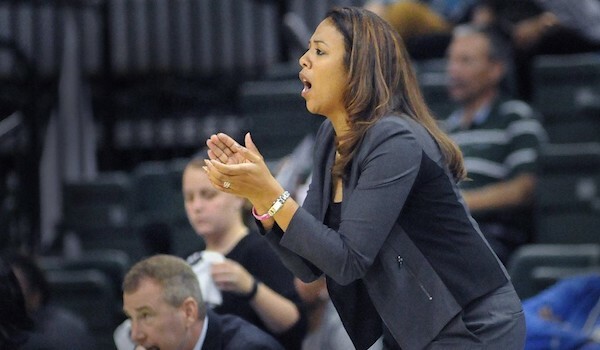 After six seasons as an Assistant Coach at Wright State University, Katrina Merriweather was offered the chance to move over one chair and become the program’s Head Coach in 2016. She quickly took full advantage of the opportunity, leading the program to a 25-9 overall record and WNIT berth. The success WSU achieved resulted in Merriweather being recognized as the 2016-17 Horizon League Coach of the Year. Can you take us through your emotion once you were officially named the new Head Coach at Wright State? I let out a combination of a loud sigh and low scream and then dropped my head. Tears filled my eyes and all I could say was, “Thank you. Thank you for believing in me.” I was grateful, relieved, and eager. After calling my family, I started calling my staff then recruits. It was the most exhilarating feeling I’ve ever had, until my first game. What benefits and challenges were there in transitioning from Assistant Coach to Head Coach at the same University, Wright State? The number one benefit was familiarity. People, polices, procedures, and the area. I also didn’t have to move right away. Recruiting was happening during the hiring process. We had multiple official visits. I was able to get right to work. The challenges also evolved around familiarity. My main role as an Assistant Coach was student-athlete welfare. I was close to the kids and the one most of them talked to the most. Although I had a great mentor who shared many facets of the program with me, there were some things I assumed because of my familiarity. I realized very quickly that regardless of my prior information or knowledge, I needed to be very thorough and expect the same from my staff. What strategies have you implemented to try to create a cohesive team environment? Owning up to my peeves, quirks, and all the things that are most important to me. Soliciting opinions in meetings and being sure to meet with everyone when there are deicisions to be made. It’s critical that everyone on the staff feels that their opinion is heard and valued. I do the same with our kids. I will always believe that communicating and being as consistent as possible earns the trust and respect of everyone in a program. Especially the kids. We will do fun things together from community service and go-cart riding to snowball fights in the Winter. We talk a lot of trust, respect, accountability, commitment, and ethics. Everyone knows what we stand for and what our goals are as people, students, and competitors. My best advice to prepare to become a Head Coach is to figure out the type of culture you want to develop. That culture should be one you can cultivate that reflects you. Knowing that will help you hire the right people, tell you how to manage the people around you, and recruit the right players. The majority of my time is spent on player maintenance and managing the people within our program. Running a program is like a fine tuned machine and the people are the parts. As a leader, you have to lead by example, communicate effectively, and show everyone around you how appreciative you are that they are willing to embark on this journey with you.